DUNBAR'S INVENTED A NEW GENRE: CALL IT CREOLE-FOODIE-NOIR. 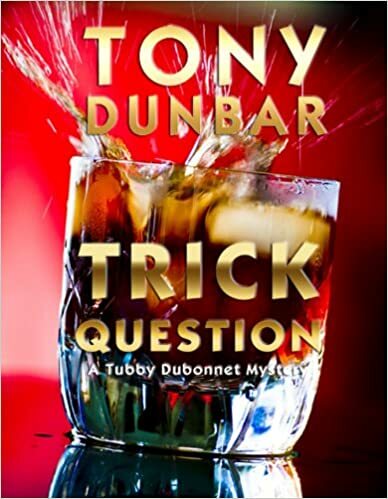 Trick Question is the THIRD mouth-watering mystery in Edgar- and Anthony-nominated author Tony Dunbar's beloved TUBBY DUBONNET series. Medical lab janitor Cletus Busters is caught red-handed in a restricted area with the frozen head of Dr. Whitney Valentine, one of the lab's most prestigious researchers. Busters won't say much, except that he's innocent. But given his conspicuous record and past as a voodoo guru, all signs point to life in prison. With the trial less than a week away, Busters' lawyer has made exactly two motions - heading to the bar for several rounds of Wild Turkey and begging Tubby for help. Meanwhile, Tubby's taken on a new client - a female boxer with an abusive boyfriend - and also has to referee the romantic entanglements of his ex-wife and three teenage daughters. But as Buster's trial proceeds, and the jury savors the startling evidence (alongside Dunbar's succulent descriptions of Crescent City cuisine), the danger mounts. Revealing the murderer could prove to be Tubby's biggest triumph – or his last case ever. Warning: Do not attempt to read this book without a handy snack – preferably a Hubig's pie or a pack of Zapp's potato chips. Both would be better.